I’m Ed Smith, a Stockton truck accident lawyer. Recently, Stockton Fire Truck 3 was involved in a collision while in route to a traffic accident. Truck 3 was struck during a code 3 rescue and while in the middle of a U-turn to access the scene of the traffic accident. A car failed to yield the right-of-way and tried to pass the fire truck which resulted in the collision. There were two injuries to Stockton Fire Department personnel. The driver of the car also suffered minor injuries from the crash. Thankfully, in this instance, all injuries sustained by the parties involved were described as minor. Code 3 is generally described in this country as responding to an emergency using lights and sirens. Accidents involving government vehicles can lead to serious injuries. When a government vehicle is traveling in a code 3 response, please make sure you allow them the right-of-away and be patient. Be aware that they may need to make a U-turn. You never know when you might be the victim waiting for rescue workers to respond. Wouldn’t you want other motorists cooperating with rescue personnel as they try to access your accident location? We all need to be considerate, patient and diligent and do our part to yield to our public servant vehicles. Thankfully, the above incident was not catastrophic.There could have been a severe delay in dispatching alternate resources to access the original traffic accident and respond to the injuries caused to Truck 3. The above incident should serve as a reminder of what not do when you see emergency vehicles approaching. 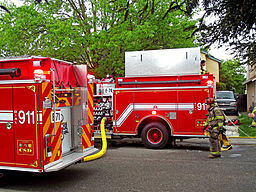 It is best to yield and be patient, rather than be in a hurry and try to outrun a fire truck. If you think your accident with a government vehicle was not your fault you should promptly call a lawyer experienced in filing claims against the government. This type of lawyer can help protect your rights and assist you in receiving fair compensation for your emotional, physical and financial damages. It is crucial to know that claims against government entities must be filed within 180 days or six months, from the date of injury or death. The stature of limitations, the time frame by which you must file your case, is significantly shorter than that for other types of personal injury claims, which is generally two years. Federal and state tort claims acts have a lot of complicated procedural and notice requirements that can bring about potential traps for a lawyer with minimal experience or for a layperson. I’m Ed Smith, a Stockton Truck Accident Lawyer. If you have been seriously injured in a motor vehicle accident involving a government vehicle, please contact me at (916) 921-6400 or (800) 404-5400 for free, friendly advice. View my outstanding customer reviews, here: Yelp, Avvo and Google. I’m listed in the Million Dollar Advocates Forum. These are trial attorneys having won multiple cases worth more than a million dollars. Take a moment to read my Past Settlements and Verdicts page.